Citizens and property owners may wish to consider who is responsible for administering essential services and for governing the quality of life, both currently and after Massanutten would incorporate into a town. This includes with respect to the governing bodies and elected officials of Rockingham County, MPOA, and an incorporated town of Massanutten (if incorporated). A summary of this consideration is included in table below. Please refer to Section VII of this report for more details. Currently, County citizens elect a County Supervisor (based on County Districts), who is responsible for creating and amending county ordinances and a budget. County citizens also elect a Commissioner of Revenues who is responsible for determining property assessments and collecting taxes; a County School Board Member (based on County Districts) who is responsible for establishing education policies; a County Voter Registrar who is responsible for county and town elections; and, a County Sheriff, Commonwealth Attorney, and a County Clerk of the Court who are responsible for law enforcement and court services. 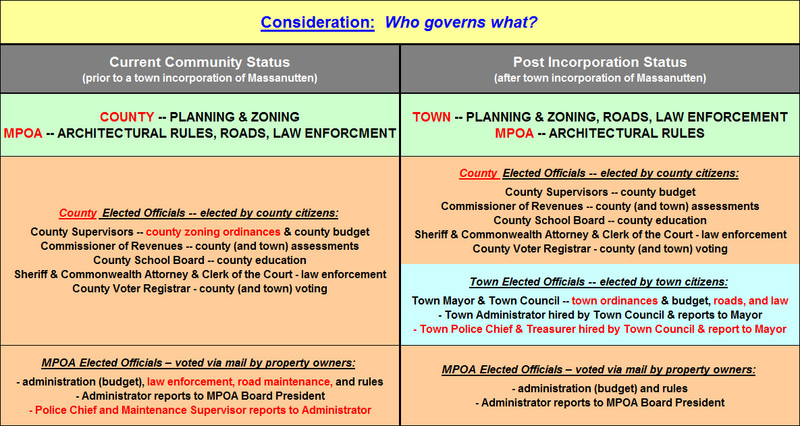 If Massanutten incorporates into a town, Town citizens would still participate in elections for all of these County officials. Their duties would continue to be the same, except that the County Supervisor would no longer be responsible for planning and zoning. Currently, Massanutten Village property owners elect an MPOA Board of Directors. This election is conducted by mail with owners of each lot in Massanutten Village receiving one vote — meaning an owner of six lots gets six votes, an owner of one lot gets one vote, and a renter of a home gets no vote. The MPOA Board is responsible for the budget and policies associated with the administration of the association, as well as with the law enforcement and road maintenance services in Massanutten Village. It should be noted that the MPOA Administrator reports to the MPOA Board President. And, the MPOA Chief of Police and the Maintenance Supervisor reports to the MPOA Administrator. 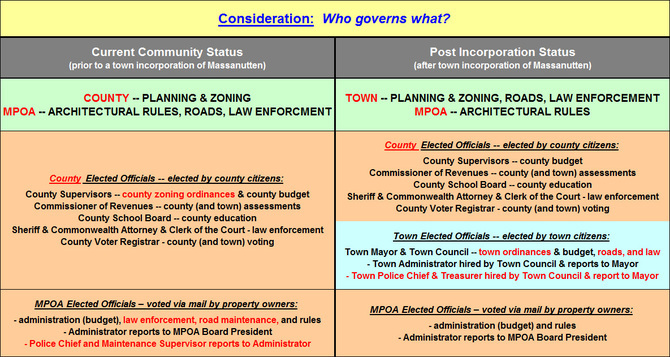 If Massanutten incorporates into a town, Massanutten Village property owners would still be part of MPOA and elect the MPOA Board of Directors. The MPOA Board is still responsible for the budget and policies associated with the administration of the association to include Rules & Regulations. However, they may or may not be responsible for the budget and policies associated with the law enforcement and road maintenance services of Massanutten Village, depending on whether these services would be provided by the incorporated town. If Massanutten incorporates into a town, all Town citizens (who are registered to vote) would elect a Town Mayor and Town Council Members — towns like Elkton have a greater than 60% voter turnout in town elections demonstrating significant community interest. The Town Council would be responsible for creating and amending a Town Budget, Town Ordinances, and a Town Comprehensive Plan. The Town Mayor would be responsible for policies related to town road maintenance and law enforcement, if these services are provided by the Town. The Town Administrator, Police Chief, and the Treasurer would report directly to the Town Mayor. Additionally, citizens and property owners may wish to consider which governing body is legally responsible to conduct planning and zoning, both currently and after Massanutten would be incorporated into a town. This includes the creation and amendment of zoning ordinances; the creation and amendment of a comprehensive plan; and, the administration and enforcement of zoning ordinances. These services are the only services VA Law requires a town to provide — it is the primary consideration of «pre» and «post» incorporation. A summary of this consideration is included in table below. Please also refer to Section VII of this report for more details. Currently, the County Supervisors are responsible for county planning and zoning policies with a county focus addressing county concerns and county quality of life for all of its more than 76,000 residents. The Supervisors weigh the benefits of county growth and associated increase in county tax revenues, with the cost to provide county services and the impact to county quality of life. As an example, when the Supervisors approved the development of the Wal-Mart Distribution Center, it knew that the quality of life of a few county residents would be impacted negatively, while the majority of county residents would benefit from the additional county tax revenues. If Massanutten incorporates into a town, the Town Council would be responsible for town planning and zoning policies with a town focus addressing town concerns and town quality of life for its roughly 2,400 residents. The Council Members would weigh the benefits of town growth and associated increase in town tax revenues, with the cost to provide town services and the impact to town quality of life. Currently, the County Supervisors appoint County Planning Commission members, who are responsible for making recommendations to the Supervisors on county planning and zoning actions to include the creation and amendment of a County Comprehensive Plan. The County Commissioners promote a county focus addressing county concerns and county quality of life for all of its more than 76,000 residents. If Massanutten incorporates into a town, the Town Council would appoint Town Planning Commission members who would be responsible for making recommendations to the Town Council on town planning and zoning actions to include the creation and amendment of a Town Comprehensive Plan. The Town Commissioners promote a town focus addressing town concerns and town quality of life for its roughly 2,400 residents. Finally, the County Supervisors currently appoint a County Zoning Administrator who ensures that county property owners comply with County Zoning Ordinances. The County Supervisors also appoint members to a County Board of Zoning Appeals to hear appeals of compliance decisions and enforcement actions by the County Zoning Administrator. If Massanutten incorporates into a town, the Town Council would appoint a Town Zoning Administrator who would ensure that town property owners comply with Town Zoning Ordinances. The Town Council would also appoint members to a Town Board of Zoning Appeals to hear appeals of compliance decisions and enforcement actions by the Town Zoning Administrator.